SK-II is celebrating 15 years of transforming skin to crystal clear in Malaysia this April with a special 15th anniversary exhibition at Suria KLCC. The display will showcase SK-II’s Pitera heritage and testimonials from its impressive line-up of Global Brand Ambassadors and Malaysian women on the brand’s star product, SK-II Facial Treatment Essence. Affectionately known as ‘Miracle Water’, Facial Treatment Essence contains more than 90 per cent Pitera, the exclusive ingredient in every SK-II product which helps deliver crystal clear skin to women throughout the world. Public are invited to view and learn more about SK-II at the exhibition happening at the Suria KLCC Centre Court, Concourse Floor from 3rd to 9th April 2013. You can also get a complimentary skin analysis from SK-II’s beauty consultants and find out how you too can achieve crystal clear skin with SK-II. You will also have a chance to catch award winning Malaysian-born actress and SK-II’s Global Brand Ambassador, Lee SinJe who will make a special appearance at SK-II’s 15th anniversary exhibition. 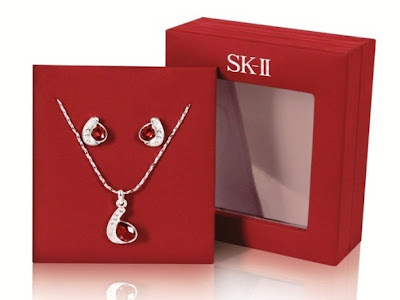 To celebrate its 15th anniversary in Malaysia, SK-II is presenting a *limited edition jewelry set crafted with Swarovski elements worth RM299 for purchases of RM1,500 and above inclusive of SK-II Facial Treatment Essence. Sk Jewellery Malaysia was conceptualized as the ultimate symbol of fashion luxury, with the vision of a world-class jeweller.